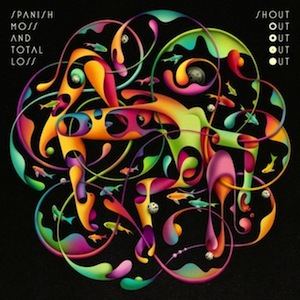 If Florian Schneider (of Kraftwerk) sat down, closed his eyes, and attentively listened to Shout Out Out Out Out’s latest efforts in their third and flawlessly compressed LP, he would probably mistake their sound for his own. Though Spanish Moss and Total Loss is not wholly the feel of “The Robots” (1978), the Edmenton collective execute the definition of a multitude of old-school electronic subgenres with an astounding ease. “How Do I Maintain Part 3” exudes a vocal-omitted Depeche Mode and a dynamic Cybotron, circa their debut. Interweaving 1988-like, rhythmic Chi-Town house leads, the second track traverses its six minutes with a nostalgic trip and head-bopping frenzy. Final track, “Knowing,” extends an even warmer welcome with simplified, electrifying bass pads bubbling in the background. Consistent in its rhythm, the Canadian electronic group affirm that bringing back old independent industry trends is one of many endless possibilities; simple, aesthetic, mechanically firm and heavy with musical characteristics. The record’s tempo is low, the feel is more ambient than rave-ridden, and the Giorgio Moroder-like auto-tune offers a comforting chill in its intermittent use. Some egotistical laptop musicians, who bask in knowing every electronic record from the seventies and eighties, would learn a lot from listening to this crew.